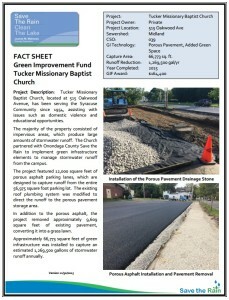 Tucker Missionary Baptist Church, located at 515 Oakwood Avenue, has been serving the Syracuse Community since 1954, assisting with issues such as domestic violence and educational opportunities. The majority of the property consisted of impervious areas, which produce large amounts of stormwater runoff. The Church partnered with Onondaga County Save the Rain to implement green infrastructure elements to manage stormwater runoff from the campus. The project featured 12,000 square feet of porous asphalt parking lanes, which are designed to capture runoff from the entire 56,975 square foot parking lot. The existing roof plumbing system was modified to direct the runoff to the porous pavement storage area. In addition to the porous asphalt, the project removed approximately 9,609 square feet of existing pavement, converting it into a grass lawn. Approximately 66,773 square feet of green infrastructure was installed to capture an estimated 1,269,500 gallons of stormwater runoff annually.